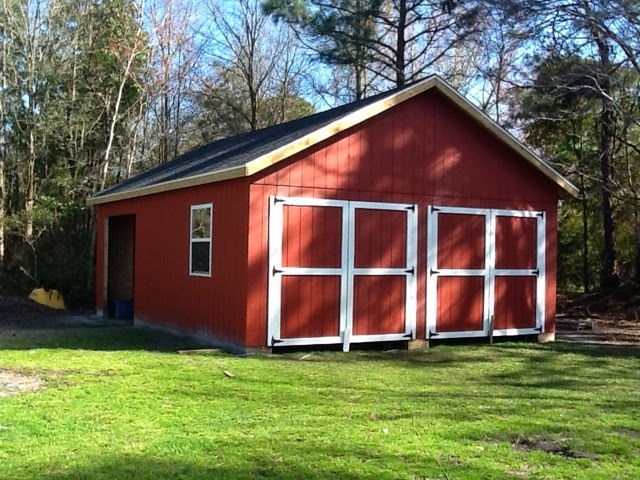 FancyGantz: Progress on the Barn! I'm so excited about Aaron's new barn! I've talked about it before, but I wanted to share a new photo of our progress. We were able to install the front doors and it is starting to look finished. We still need to work on a few things, but I just love the progress! When we first moved here to Wilmington, I worked at Lowes as a part time cashier. I especially loved working in the Lawn & Garden Department. Last week when Aaron and I went in to make a payment, my old supervisor checked us out. He told me they were hiring and he encouraged me to re-apply. I guess they're really busy and he doesn't have enough help. I told him I'd think about it. I did and decided to apply. I haven't heard anything about my application but today when we went in to make our payment, he was there again. He immediately said, "I've got a register out in Lawn & Garden waiting for you!" I told him I applied but hadn't heard anything. He said he was going to talk to the hiring manager and I guess he did. By the time I got home, I had a message from her. I'm not sure it'll work out or not because I am only available three days a week, however I've decided if they offer a position to me, I will take it. :) I'll keep ya posted! Introducing Cash, Aaron's New Ride! We no longer OWE Lowes!